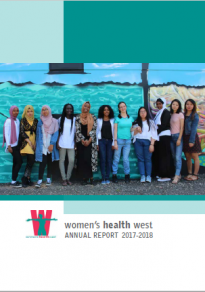 Women’s Health West’s Annual Report provides an overview of all of our programs and services, from primary prevention, to early intervention and response. It provides a short overview of each program, what we set out to do, what outcomes we achieved, and the future direction of each. It also provides information on our finances, staffing and organisation-wide plans, our advocacy work and key partnerships. The report can be downloaded in full, or ordered as a print version free of charge. Please select whether you would like to collect your order from our office in Footscray or have it sent via post. Please enter a few details here so we can ensure we give you the right order when you come by the office. Please let us know what day you would like to pick it up.